My Mom was a person who never met a stranger. She could strike up a conversation with any random person and talk for 20 minutes, pleasantly shooting the breeze without batting an eyelash or looking at her watch once. I used to be like that but not anymore. These days I’m more like a social recluse. I guess it’s because I’m in the shroom house most of the day, (sitting at this desk,) and my interactions with living, breathing beings has become so infrequent, my dexterities are atrophying. When I find myself in social situations now, I feel like the model for awkwardness. Don’t mind me, I’m just fine on my toadstool over here. Not the smoothest of operators. That is, unless you take into account my electronic interactions. Ahhh, social media. In that realm, I’m a veritable jetsetter. Arm me with my Twitter account and I’m unstoppable. Social media, what an interesting phenomenon we’ve set up for ourselves. It’s almost like a new life form, an alien, and we’re waiting to find out if it’s going to feed us, or eat us. My youngest, Kev, says it’s going to be the downfall of humanity. It’s a little depressing to hear him talk about it. I prefer to take the Pollyanna approach. (That pretty much sums up my entire MO.) As with all things that include human interaction, there is some good in it and some bad. Although, sadly, seems like lately there’s more crap on my Twitter feed than posts of value. People spend entirely too much time posting pictures of horrible skin diseases, bountiful (and scantily clad) booties, and obscenely muscular men. Want to look like the Hulk without lifting a single weight? Try our highly questionable new supplement. (Just disregard that extra head that appears. Two heads are better than one, right?) And, if you want to gaze at the underbelly of politics, just tool around on Twitter for a while. You’ll have more ridiculous information about the foibles of politicians than you ever cared to read. It’s not all bad though, there are people putting cool things out there too, music and art and literature. Photography is a biggie, especially pictures of animals. Who doesn’t want to look at a row of eleven black and white Labrador puppies, sound asleep, lined up like a set of piano keys? I “liked” it. Who wouldn’t, it was so stinkin cute. Made me smile and that’s never a bad thing. That’s the beauty of Twitter ~ choice. It’s where I seek out news and information these days; if it’s trending, you can read about it. If it’s mutant muscles, you can scroll past it. Unlike network or cable stations, their content is relentless; politics is agendas, war is entertainment, and Caitlyn Jenner’s personal life is breaking news. The days of intelligent and straightforward reporting are gone. I just can’t do it anymore. What happened to news being news? I think the alien has already taken control of our media outlets and based on the direction they’ve gone, looks like we might be lunch. But again, it comes down to choice. There is no denying it, social media is a powerful tool. And the rub is all about how we choose to use it. Makes me think of an old Cherokee fable BK posted in his blog a while ago; it was also on a poster in the room where I taught, which I thought was cool since I do love the story so. (The school mascot is a wolf. That contract is done, btw, I’m available. Just thought I’d throw that in there.) Anyway, the story goes, a grandfather is explaining the situation behind a dispute within the tribe to his grandchildren. One of them asks, “Grandfather, why do people fight?” He tells the child that there are two wolves in our chest, a black wolf and a white wolf. The black wolf is filled with fear, anger, envy, jealousy, greed, and arrogance. The white wolf is filled with peace, love, hope, courage, humility, compassion, and faith. He also mentions that the two wolves are constantly at battle. The child then inquires, “Which wolf wins?” The old man replies, “The one that we feed.” I don’t know about you, but I’d prefer a world where our choices fortify the light. Not sure we’re doing enough of that these days. 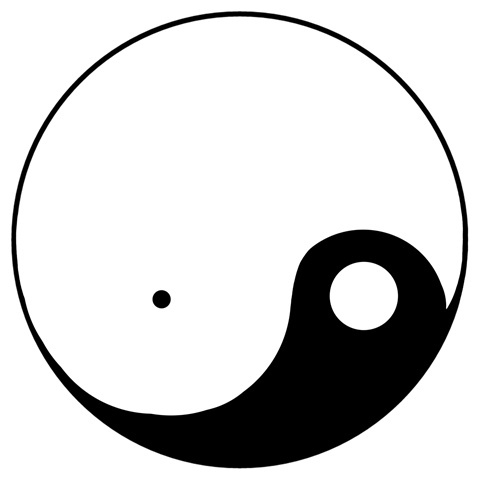 In my opinion, the yin yang is all wrong. An equal balance of good and bad breeds the constant battle. The white side should dominate. Instead of nurturing both equally, why aren’t we feeding the white wolf a steady diet to fatten him up? Recently, I had a discussion about social media, Facebook in particular, with some dear friends. All of us agreed, the awful is starting to outweigh the awesome. Especially where politics is concerned. Having the freedom to share opinions is a good thing, inflicting them is all together another. Civility is grossly under-rated. Because we can rant behind the cover of our keyboard, reasonable limits are a thing of the past. Don’t get me wrong, I love the connections social media has fostered. Simple things like wishing happy birthday to people I love and respect make it worth plugging in everyday. Celebrating children, special events, friendships, all time well spent. But overall, I find myself gravitating to the image driven sites, the ones that keep words to a minimum. Instagram, hands down, is my favorite social hangout, (the tag line on their website says it all, “Capture and Share the World’s Moments.” The white wolf dominates there, at least on my feed he does. "God sends me little moments all day long to say: You're not alone, brother. Just a little while ago, an old hunched-over Chinese lady smiled at me with the greatest warmth in her eyes." "And you think that was a message from God?" "I think that was God." We are quickly becoming defined by what we post and what we follow. It’s interesting that the term “news feeds” was coined. It’s more accurate than we give it credit. We are being fed by the media, social and otherwise. There is wisdom in looking at the present balance, in controlling, by our responses, what proliferates. Will it be fear, anger, and arrogance; or will our world be defined by peace, love, and compassion. It’s our choice.